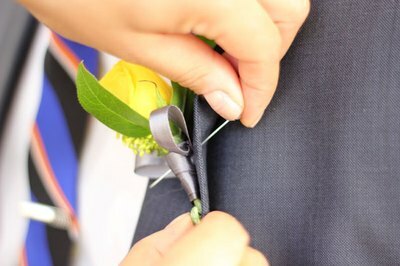 Boutonnieres and corsages add elegance at formal affairs, but the truth is, many people are not sure how to pin them to clothing or are afraid they will stab their date with the pin. Whether you're pinning a flower on a jacket lapel, dress shirt or a gown, follow these simple steps for a great start to that special evening. Position the boutonniere on the left jacket lapel. The flower should be on top of the buttonhole of the lapel, and the stem midway between the left and right edge of the lapel. Turn the lapel over so you are can see the back. 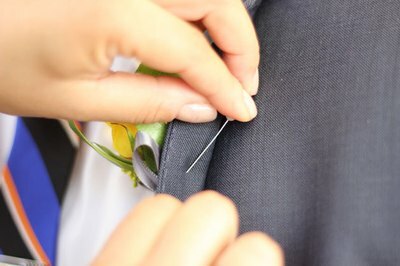 Insert the pin through the fabric and out the front until you make contact with the boutonniere. 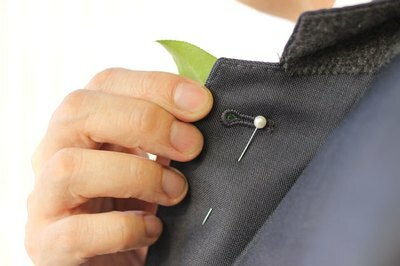 Once the pin goes through the fabric to the front of the lapel, continue inserting it into the stem of the boutonniere. Make sure the boutonniere is in the position you want it. After the pin has gone through the boutonniere stem, direct the pin back behind the lapel so the point is hidden. Notice that the pin is in an up-and-down direction, along the length of the boutonniere, which keeps it from flopping around left and right. 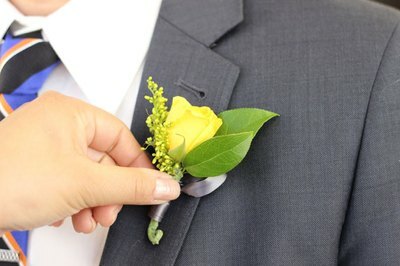 Sometimes at special events jackets are not required, so the boutonniere must be pinned to the shirt. Because you can't flip the shirt over to start from the back, the pin will start and end on the front of the shirt. Position the boutonniere on the shirt just below the left shoulder on the upper chest. Pinch the shirt away from the body and insert the pin in this order: 1) into the shirt, 2) out the shirt, 3) through the stem of the boutonniere, 4) out the stem of the boutonniere, 5) into the shirt, and 6) out of the shirt. 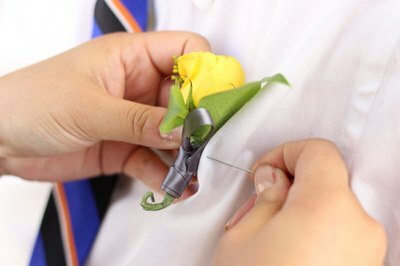 Pinning a corsage on a gown is similar to pinning a boutonniere on a shirt – you have to start from the front. Hold the corsage by placing your thumb on the flowers and your fingers on the inside edge of the neckline. Pull the neckline forward to keep the pin away from the body, and then: 1) insert the pin through the fabric, 2) out the fabric, 3) through the corsage stem, 4) out the corsage stem, 5) into the fabric, 6) and then out of it. 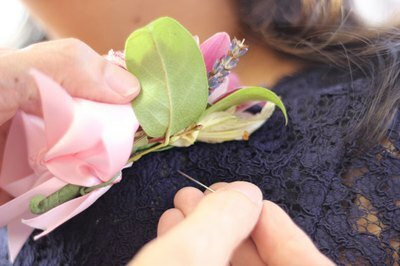 Note: Because corsages are larger than boutonnieres, you may need two pins to keep the corsage secure.